Experience mathematics and hone your problem-solving skills with THE NATURE OF MATHEMATICS and its accompanying online learning tools. The author introduces you to Polya’s problem-solving techniques and then shows you how to use these techniques to solve unfamiliar problems. You’ll also find coverage of historical topics, and exercise sets that feature problems applied to real world settings. 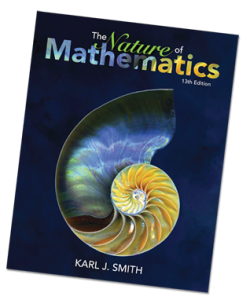 The Nature of Mathematics – 12th Edition site is still available.